Soul of the Tiger takes us to a increasingly-threatened world where human life is intimately linked with rhinos and cobras, elephants and man-eating tigers, and eagles which fight snakes — both in the physical world as well as the metaphysical and divine realms. The fascinating, bizarre, and often humorous accounts reveal the vital connection between people in Southeast Asia and their animal neighbors; to the villagers, animals are omens, divinities, meat, leather, competitors, and even ancestors. We meet a Bornean farmer, who, although an Evangelical Christian, waits to plant his rice until the yellow wagtail arrives. Witness animal fights that fill the needs once met by headhunting. Talk with Indonesians who believe that man-eating tigers carry the souls of their victims. The authors outline the four “eco-cultural revolutions” which have permanently and dramatically changed the face of Southeast Asia — the first time such revolutions have been identified in this way. And they suggest a fifth “eco-cultural revolution” which could reverse the trend of environmental destruction and lead to a new sustainable relationship between people and nature. A couple of years after completing Soul of the Tiger we were invited by Thai friends to participate in an annual “cursing ceremony.” In this very Asian version of an eco-primal scream, farmers near Chiangmai call on forest guardian spirits to bring misfortune, even death, to outsiders who cut down the peasants’ trees. This is great, we told ourselves. This is what conservation is all about — local people looking after their own resources, in their own culturally-specific way. Then we returned to Bangkok and the euphoria died. Bangkok was a bigger mess than ever. Traffic, pollution, crime. Behind it all: big money. 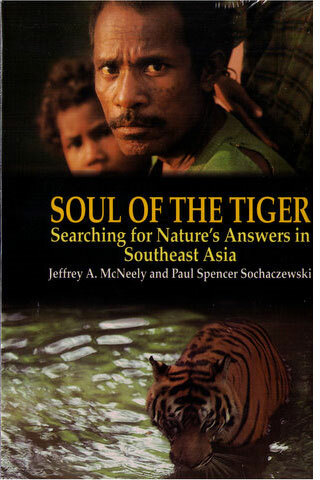 In the six years since the first edition of Soul of the Tiger, Southeast Asia has boomed. While much of the rest of the world has suffered from recession and economic stagnation, Malaysia, Thailand, and Indonesia have prospered, with economic growth rates of over five percent per year. Even sleepy Laos and Burma are beginning to awaken. Vietnam is expected to be the next economic tiger. Economic prosperity for people is a mixed blessing for nature. On the one hand, a better national economy is often related to increased eco-sophistication among government leaders who place greater emphasis on nature conservation. And because much of the new money comes from tourism, which largely is based on maintaining what tourists believe is pristine nature, increasing lip service is given to maintaining beautiful landscapes. Education levels continue to improve, thereby offering a broader support base for the nature-oriented non-governmental organizations that are sprouting throughout the region. The bad news is that much of the economic boom is based on selling everything that crawls, swims, shrieks, or bends in the wind. We admire men who can wander into the forest, armed only with a bow and arrow, clad in a pair of old basketball shorts and a smile, accompanied by a skinny dog, and return a couple of hours later with a deer. With the ease by which we call up for a pizza (double cheese, cholesterol be damned), our friend Zakarias, on the isolated Indonesian island of Aru, brought us dinner. Gnawing on chunks of venison we talked about resource use. Zakarias is more or less self-sufficient, which is nice but it doesn’t bring in a lot of cash. And people today need some cash, even in as isolated a place as Aru — to pay school fees, to buy kerosene and monosodium glutamate and beer and soap, to buy a t-shirt and a dress for the wife. Given half a chance, there are precious few societies in the world where people would pass up the chance for electricity and TV, motorcycles and access to a town. The “black mop-headed savage” referred to by British Victorian explorers may indeed be noble, but his happiness in being naked lies largely in the eyes of the beholder. We asked Zakarias how he made money. He explained that he sells birds’ nests, bird of paradise skins, and deer jerky. Had he lived on the coast his answer likely would have been sea cucumbers, dugong meat, and sharks’ fins, the same commodities that Aru villagers have traded for hundreds of years. He relies on nature, and two of his main sources of cash are protected or vulnerable species. How much can he make? If we had really wanted to ruin his day we would have told him that he’s getting ripped off. The mercantile trail of birds’ nests is well-documented. The local Chinese trader who buys Zakarias’ nests will resell them for a tenfold profit to another Chinese middleman in the distant Sulawesi city of Ujung Pandang. By the time they reach Hong Kong a restaurateur will be asked to cough up US$5,000 a kilo. And he will, because people in distant countries, who couldn’t spell Aru if you spotted them the A and the R, want the product and can afford to pay for it. Had Zakarias noticed a reduction in birds nests or fish or big mammals? “What if you only collect nests twice a year? What if you set up some kind of control system?” we asked. This to us is the vicious cycle. Wherever people aren’t in control of their resources, nature gets hammered. This is the essence of the conservation problem. We rubbed our greasy hands on the dog, who seemed to appreciate the attention, and around the fire we got to talking about abstractions. Zakarias was silent. We pushed. Is there an Arunese equivalent of the American dream in which any child can grow up to be Bill Clinton? “The boy will probably grow up to be like me,” he finally admitted. Zakarias asked us what we thought would happen to nature. We felt strangely close to this man. We told him that in South America and Africa and all over Asia we had seen the same problems he faces. We explained that rich countries, like ours, could afford anything they wanted, and that less-rich countries, like his, survived by selling these luxuries. We told him about bird of paradise feathers being in demand a century ago for ladies’ hats, and how restaurants in Singapore and Hong Kong had an insatiable demand for birds’ nests, shark fins, and sea cucumbers, though the people who enjoyed these delicacies had no idea about what was happening to resources in Aru. In his own village, Zakarias was too poor to offer us tea. In a subversive mood, we explained to Zakarias how an increasing number of Asians no longer take government plans for granted. In Thailand’s Buriram Province in 1989, 2,000 angry villagers torched a commercial eucalyptus nursery. The land was theirs, they argued, and to make matters worse, the villagers recognize that the exotic eucalyptus is a notoriously eco-unfriendly tree since it draws large quantities of water and supports little wildlife. In nearby Tak Province, residents of nine villages demanded an end to logging operations because of the damage caused to farmland and water resources, while in Nan Province, villagers claimed that logging was destroying their watershed areas and vowed to resort to violence to prevent the concessionaire from taking thousands of logs out of the forest. We talked about the need for a Ratu Adil, a just leader. How local people, like Zakarias, know full well how to maintain wildlife populations but don’t have a chance because the global marketplace forces them into rapidly depleting their birds nests. If Zakarias doesn’t make money from nature someone else, an outsider, will. To us it was clear. Don’t give outsiders a chance to get rich, we said. We thought we should tell him about UNPO, the Dutch-based Unrepresented Nations and Peoples Organization that fights for Mohawks from Quebec, Kurds from Iraq, and Frisians from Holland. And if that doesn’t work, well, get tough. Then we stopped. We listened to ourselves. We sounded like Che Guevara. Like college students of the late sixties, which maybe we still are, in our hearts. Rebel! we wanted to shout. Get control of your destiny! Peasants of the world arise! Zakarias had never heard of Che Guevara. But he had heard of the Irian independence movement, just an island away. He was hesitant to talk too openly, even though we were in the middle of the forest. We were foreigners, who had metaphorically parachuted into his closely structured world. We too, felt somewhat awkward. What were we opening up? Surely thoughts and ideas can’t hurt him? “Wouldn’t you be happier being in control of your resources?” we asked, our revolutionary zeal beginning to fade. With each question Zakarias became increasingly withdrawn. To us the conversation was a mischievous intellectual exercise, like musing, in the late sixties, whether we should take over the university president’s office. To Zakarias, however, this talk was conspiratorial and not at all in the spirit of Indonesia’s national feel-good philosophy of pancasila. Our mentor Dr. Boonsong Legakul died in Feburary 1992, just a week before one of the largest gatherings of conservationists ever held. At the Fourth World Congress on National Parks and Protected Areas, held in Caracas, Venezuela, everybody finally realized a point that Boonsong had been making for several decades: that conservation works best, that conservation perhaps only works, when people are involved in the management of the natural resources upon which their welfare depends. This concept of community participation, based on strong cultural and spiritual values, is the theme of Soul of the Tiger. But since writing this book we have come to appreciate better the paradox that people face in Asia. On the one hand, the concept of community responsibility is still valid, perhaps more than ever. On the other hand, it is becoming increasingly difficult for communities to retain their cultural identities and responsibilities for their own future. The external forces that prey on Zakarias are minor compared to the impositions faced by millions of other rural Asians. Hill-tribe farmers in the Golden Triangle of Laos, Burma (oops, Myanmar), and Thailand are convinced by external forces to grow export crops like opium instead of crops that keep people alive. Huge para-statal plantation operators turn vast tracts of forest into oil palm plantations, displacing or marginalizing thousands of Malaysians. Timber tycoons in Indonesia get rich while ignoring the relatively simple needs of people who live in or around the forests. Who’s to blame for this greed? Pick a villain; there’s no shortage. The World Bank. Our over-consumptive western society. Japan — they’re bound to be guilty of something. GATT-the General Agreement on Trade and Tariffs, which promotes the global marketplace. Corrupt politicians. Missionaries who fight for souls, and conservationists who offer a parallel version of salvation. The folks in the next valley who move in, jabbering in a strange language and growing maize in the once-sacred forests. We thought about this evolving turn of events during the Caracas meeting. We were still mourning Boonsong. We remembered how his prophecy that he would die a slow death as retribution for his earlier days as a hunter had come true — he had lain in a virtual coma for six years resulting from a series of strokes. We sat in the air-conditioned conference center of the Caracas Hilton. We had not been outside for a week. More than 2,500 delegates from everywhere — well-intentioned all — spoke eloquently and passionately about the need to involve people in the conservation equation. We thought of Zakarias out in Aru, scraping “his” birds’ nests off the lofty walls of limestone caves, before someone else got to them first. Today these discoveries are heralded as representing Vietnam’s staggering biological diversity. The idea of biodiversity is as important to conservation as the idea of loving your mother is to Hallmark cards. Biodiversity has become one of the most powerful mantras of the environmental movement. Interestingly the concept hardly existed six years ago — you won’t find the buzz word biodiversity in this book. Biodiversity, which refers to the variety of life at genetic, species, and ecosystem levels, has spawned an important eco-industry. One of us launched the first major global public awareness campaign on this theme, and the other is so entrenched in the concept that he has “biodiversity” in his job title. Where the scientists and campaigners go the bureaucrats and lawyers follow. A new international convention, which virtually all Asian countries have ratified, is devoted to biodiversity. This convention was negotiated in record time, which is especially surprising since it deals with prickly legal, ethical, and economic issues such as whether genes are the property of a particular individual, nation, or the world, how much biotechnology should be allowed, and who has the responsibilities of safeguarding and paying for the protection of genetic resources. Biodiversity has become so seductive a concept that several hundred million dollars of new money for conservation has been donated by rich countries to help poor countries save the “treasure chest of nature’s wonders before it all gets thrown in the bonfire,” as one ebullient publicist noted. We like living in Europe, but we miss Asia and try to go back regularly. On a trip to the Moluccas, we shared a meal of bitter, skinny fish with Ahmad, a village headman on the small island of Bobale, off the coast of Halmahera. We were interested in the complex traditional system of sasi, in which a “conservation committee” establishes prohibitions on entry, harvesting, fishing, or hunting in community-controlled areas. Sasi, or the equivalent, is found throughout much of Southeast Asia and is an effective way to regulate access to resources so that they are not over-exploited. Is this the way sasi has always worked? This scarlet-letter-like punishment suited our puritanical streak. Except in this case the culprit who defied sasi was branded for defiling a relationship with nature, rather than a relationship with a spouse. We wanted to know whether the system still functions. “Sasi is under a lot of pressure,” Ahmad sighed. “Televisi,” he said, pointing to the Sony. “People here now watch television, and want what other Indonesians have.” We had seen it all. Through advertising work, we had even contributed to the growing consumer society. People need money to conduct religious rituals, to pay school fees, to buy an outboard motor. The cash society seems inevitable. “People are getting greedy. I’m being forced to reduce the time between the closed sasi seasons, even though I know our fishery is no longer as productive as it once was,” Ahmad said, spitting out some fish bones for the cat. It is a truism that governments are made up of city folk, who generally have little understanding for rural issues. Governments promote plantation agriculture or industry to earn foreign exchange and to provide jobs. But modern natural resource use generally benefits only those already benefitting from the global marketplace, and punishes the rest. “The market” is without morals, and treats natural resources like chlorophyll-prostitutes. If Country X can provide the resources the market needs, at a price the market is willing to pay, then fine. If not, the market will go elsewhere. The market has no interest in the landslides and pollution and breakdown of traditional culture that may follow. Outsiders earn virtually all the cash benefits of the forest, but pay almost none of the long-term environmental and social costs, which are borne by Zakarias and Ahmad. Their only recourse is to join the exploiters to seek greater benefits themselves. By doing so, they unfortunately help to undermine their own, basically sustainable — but at a subsistence level — culture. Traditional management systems which were effective for thousands of years become obsolete in a few decades, replaced by systems of exploitation which bring short-term profits for a few and long-term costs for many. We would have liked to have taken Boonsong to Irian Jaya and the Philippines, where traditional cultural patterns seem to merge successfully with the pressures of the fourth eco-cultural revolution — the growth of the global marketplace. It took us five flights and two days to go from Jakarta to Merauke in southern Irian Jaya, near the border with Papua New Guinea, where we visited the newly-established Wasur National Park. Ian Craven, who was working for WWF to help people get involved in park management, told us why the area was so important. “The savanna you see stretching to the coast has actually been managed by the local people for generations,” he explained. “In fact they created the savanna, in a way, by clearing the forests centuries ago. You could almost say that the people created the habitat, so it’s not surprising that various parts of the park have strong mythological, spiritual, and food links to the people,” he explained. Ian was in a good mood because of some minor victory over the forces of bureaucracy; we marveled at his energy. Later we were particularly glad we made the trip and had had a chance to bask in his reflected success since he was killed several months later when the small plane he was using to conduct wildlife surveys crashed on takeoff. We were curious about the cultural links and Ian explained that one area in the sanctuary zone is considered the center of origin of the Marind tribe. Other areas, called dusun, are traditional gardening, hunting, or sacred sites, usually owned by the clans or families to whom they were originally assigned in tribal mythology. A number of dusun are sprinkled throughout the park. As part of the management of the national park, people who traditionally own dusun are allowed continued access to carry out traditional management practices. The people residing in the 13 villages within the national park may remain there. Traditional hunting, especially of deer, is allowed only for park residents. As a result of this approach, everybody is happy with the park instead of fighting against it, as happens in many other parts of Indonesia. We often visit the Philippines, usually to try to get the Asian Development Bank to put more of its funds into conservation and less into nature-destroying roads and dams. Although it’s hard to realize if you’re caught in a miserable, pollutant-laden traffic jam in Manila, there is good news in this curious country: successful local efforts to protect some of the world’s most productive coral reefs. One weekend, needing a break after too much arguing with ADB economists, we flew to Palawan. Of course, since we were going to look at “community-based sustainable coastal management techniques based on empowerment and cultural integrity,” we were able to write off this snorkeling expedition as being essential to the success of our professional mission. And, in fact, it was. In Palawan a young fisherman named Fidel explained how villagers have formed their own Marine Management Committees, or MMCs (grand names seem to have become de rigeur for grass roots conservation efforts), to establish and manage marine protected areas. As the marine reserve began to function and illegal fishermen were denied access, the skeptical community began to provide increasing support, and the participating villages were able to convince local government officials to bestow official protected area status on three marine reserves which are now demarcated by buoys and signs. The local MMCs actively patrol for fishermen who enter without permission. They have posted on coconut trees, the municipal ordinances which explain in Tagalog why the rules benefit everyone. We donned our masks and snorkels and skimmed over large sections of coral, which are completely protected as fish-breeding sanctuaries. In buffer zones, ecologically-sound fishing is done. Throughout the region, the MMCs prohibit previously widespread destructive fishing methods — such as using dynamite, cyanide or other strong poisons and very small mesh gill nets. Increasing numbers of tourists are visiting the sanctuaries and bringing economic benefits to the villages. The results? Fish diversity and abundance have significantly increased since the MMCs went took over. Species diversity has increased by as much as 40 percent, which pleases the biodiversity groupies. Of greater practical importance, the total fish yield for the fishermen has also significantly increased, thereby helping to ensure support for the local management of the reefs. The grilled fish barbecue we had on the beach with guitar-playing fisherfolk made a lot more sense to us than the lunches in luxury restaurants we had shared with our ADB colleagues. Boonsong, what do you think of all this? Do Ahmad and Zakarias have a chance?